With licensed movie titles generally being the bane of gaming, Electronic Arts turned a lot of heads when it released two impressive hack and slash adaptations of Peter Jackson?s ?The Two Towers? and ?Return of the King.? Shortly after the latter was released, it was learned that EA would be producing a Lord of the Rings Trilogy game that would encapsulate all three films into one game. A few months later, though, EA threw a major curveball when it announced that this game would not be a hack and slash game, but would instead be an epic-length role playing game modeled after Final Fantasy. EA isn?t exactly a powerhouse of RPG?s, which raised the question: could the same people who made two action games deliver on such lofty aspirations? It?s a complex question, but suffice to say that there is more good here than bad. 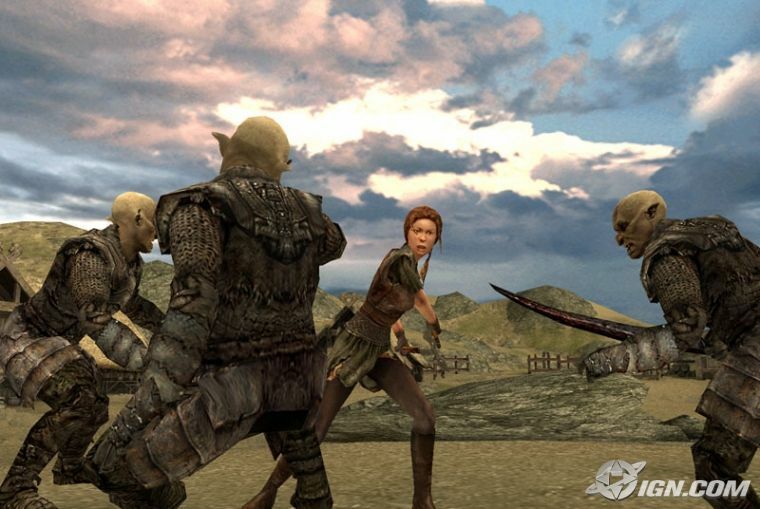 Lord of the Rings: The Third Age is a sweeping adventure RPG that puts a turn-based spin on the world of Middle Earth. This game doesn?t quite live up to the lofty expectations of the films, but it nevertheless represents the most comprehensive and definitive Lord of the Rings gaming experience to date. Before delving into the gameplay, a disclaimer is in order. It became apparent early in the game that The Third Age?s ?medium? setting was anything but. Unlike EA?s hack-and-slash, Return of the King ? which could be downright difficult even on the normal setting ? the medium setting in The Third Age was almost laughably easy. So much, in fact, that within an hour or so I decided to crank up the difficulty to hard. Although this necessitated a little adjustment on my part (the hard setting is significantly more difficult), I ultimately found my experience on the hard setting to be far more satisfying than on the medium setting. What?s more, the battles were significantly longer, and more interesting, on hard mode. Overall, the Third Age is a moderately long adventure, taking between 30-35 hours on hard mode, and probably 25-30 hours on the medium setting. (It took me around 32 hours on hard mode, including all of the sidequests and evil mode battles.) As will be more fully explained, there is very little ?fluff? in that 32 hours? unlike many games with nauseatingly-long cutscenes, most of the time spent in this game is spent in combat. The plot in The Third Age takes a novel, and perhaps risky, approach to the Lord of the Rings trilogy. You take command of a second fellowship, led by a certain Berethor of Gondor. Berethor is dispatched by the Steward of Gondor to follow the Steward?s son Boromir. Along the way, Berethor acquires new friends, including an elven mage and a Ranger who serves as the party?s archer. Admittedly, some may rue EA?s decision to put you in charge of a group of ?second-string? characters rather than the ?real? fellowship, so those who want nothing less than Gandalf and Company might be better served by going back and getting console versions of The Two Towers and Return of the King. But The Third Age is really about what you make of it. If you take this new plot at face value, it actually produces a pretty good supplementary account to the original trilogy. Not only do you get a glimpse into the lives and motivations of this new cast of characters ? complete with a couple of unexpected plot twists ? but you also get the chance to witness the aftermath of many of the movie?s key events. If you?ve ever wondered what things looked like in Middle Earth after the Fellowship did their work, this game is for you. Plus, there are at least a few occasions where you cross paths with the Fellowship and even get to fight alongside them. The Balrog scene, for example, features Gandalf as a playable character and is a real blast to play through. All of the original Fellowship, save the hobbits, make cameos in your party at some point and bring some unique abilities with them. Veterans of RPG?s should find the combat system a familiar sight. If you thought the screenshot above looked suspiciously like Final Fantasy X, you were right. The combat system borrows heavily from ? indeed, all but plagiarizes ? FFX?s mechanics, right down to the arrangement of the combat screen, the combat mechanics, and even some of the attacks themselves. The entire process is menu-driven and your characters? special moves are drawn from Action Points (AP), this game?s version of magic points. In contrast to the combat, the rest of the game bears little resemblance to Final Fantasy. This is a linear adventure-RPG with no shops and inns to speak of. Health is replenished at save points, and equipment is all found in the field. There is a decent amount of equipment to be found, and the game also maintains a pretty legitimate stat-distribution system in conjunction with leveling-up. Unfortunately, the game has you leveling up seemingly all the time, which is great for stat fiends like me and potentially frustrating for more casual gamers. Also, RPG fanatics shouldn?t expect much conversation. You get virtually no opportunities to interact with NPCs until you reach Helm?s Deep, which is quite far into the game. Instead, the game gently but firmly pushes you along the linear trail of the Fellowship, offering only a few small side quests along your long adventure. Most side quests are of the pedestrian ?find these seven items? or ?kill these eighteen goblin raiding parties? variety, though later chapters diversify your tasks a little bit and make them more relevant to the plot at hand. Another gripe about the gameplay is the way the game often marginalizes your characters. So much is made of the ?real? Fellowship that it squeezes a lot of time away from your party. And while Gandalf?s cutscene narrations are well-produced, I would have preferred to hear some of the plot delivered by my own party?s characters rather than from some distant narrator, even if the narrator is everyone?s favorite wizard. On the positive side, there is a lot to like about the way this game triggers battles. The game generally triggers battle in one of three different ways, two of them scripted. Sometimes you will encounter enemies near treasure chests; there isn?t usually any warning but you get to the point where you know they?re coming, and they always happen with the same chests. Sometimes a blue stone (palantir) will appear in the upper left-hand corner of the screen, which indicates that you are approaching a scripted battle. There are also some stretches of the game that use a random battle generator, although The Third Age should be lauded as one of the few examples of a game doing random battles right. Only select segments of the game use random battles ? which allows you to take your time and really enjoy most of the game ? and an eye of Sauron on the screen indicates when you are close to triggering a random battle, so there is no real surprise. Sometimes you can even hurry across an area to avoid triggering the battles altogether. Overall, it is a marvelously-executed system and did wonders to alleviate my concerns about the inclusion of a random-battle generator in the game. Among the game?s extra features, there are two worth noting. First, the game offers an ?evil mode? which lets you go back and play as the bad guys in certain key battles you previously fought. These battles are not only novel and fairly interesting, but winning them can also unlock new weapons and equipment for your normal party in the game, so they are worth doing simply for their impact on your inventory. Second, The Third Age does offer a nice two-player cooperative gameplay feature which allows a second player to control half of the characters during the main adventure. Like Gladius ? which was also a turn-based RPG ? this feature is primarily designed for when your friends come over. It?s a bit tacked-on, but is a nice courtesy nevertheless. The graphics engine is adapted from EA?s superb hack and slash, Return of the King, and has been tuned some to look better close-up. The end product is a solid, but not spectacular, graphical presentation that might be compared to the overall quality of Gladius or perhaps Knights of the Old Republic. Unlike Gladius, though, the special effects are the sort of over-the-top flashy eye candy that made Final Fantasy famous. The character models, too, are nice-looking and will even showcase new armor as it is equipped, a nod to Baldur?s Gate. Your foes, meanwhile, are also appropriately detailed in their evil; the Balrog, in particular, is truly a sight to behold. And the backgrounds are simply fabulous. Only in this game can you explore major locations from all three films, from Moria to Helm?s Deep to Minas Tirith. The nature of the combat system also allows you to actually take a little time to look around, rather than spend your hours hacking and slashing away. The authenticity of the recreations are striking and show the developer?s desire to really put you into Peter Jackson?s version of Middle Earth. The game?s plot is driven through a series of 109 ?epic scenes,? FMV cutscenes narrated by Gandalf (who apparently sends your main character telepathic messages) that feature clips from the movie. Although I would have traded some of them in for more character dialogue, they look really good and feature some great cutscenes from the three Lord of the Rings movies. If you?re a true combat fiend, though, you can bypass these cutscenes and even view them later if you wish. If you like Howard Shore?s score for the trilogy, you?re going to love this game. Themes from all three movies are alive and well in the Third Age, and are beautifully assigned to the appropriate settings, whether they be combat or exploration. Unlike previous the previous two EA Lord of the Rings games, this game puts the appropriate movie music in the right places, so audiophiles will appreciate hearing the Celtic riffs in Rohan and the anthems of Return of the King in Minas Tirith. The sound effects are also perfectly suited and really give off the feel of the movies, from the clashing of steel to the rumble of horses. And if that isn?t good enough, the game also features extensive voicework, and the vast majority of it is done by none other than Sir Ian McKellan himself. And McKellan, as Gandalf, does a great job as narrator and mentor to the game?s lead character. The characters in your party, likewise, are all fully vocalized, and they sound good as well. The controls are mostly straightforward, although the slim manual isn?t always totally clear as to how to perform all of the tasks. It is suggested, then, that gamers toy with the controls some at the outset to figure out how things go. On the field map, moving is accomplished by the control stick, switching avatars is effected by the X button, and the camera can be adjusted with the c-stick. In battle, the d-pad cycles through combat options, the A button confirms (the B button, of course, cancels), the X button lets you swap characters and the Y button brings up the status of your party, including any special status effects. This last option, incidentally, was one I only accidentally discovered when a friend accessed it, so make sure you pay careful attention to all the options listed in the manual. There are, sadly, two significant issues with the controls. For one thing, the GameCube version only allows menus to be navigated with the directional pad, and the control stick is only used for out-of-combat movement. Granted, the d-pad is probably better-suited anyway, but why exclude the use of control stick? This is probably a minor nitpick, but it?s worth noting. Second, and more troubling, the game does not allow you to swap characters in and out of the battle party when you are not in battle. (I posted to a few fan boards and even e-mailed EA about it, and was more or less told that this was not an option in the game.) Most of the time, this isn?t an enormous deal; most combat situations let you swap characters in and out without a turn penalty, a la Final Fantasy. Still, it seems silly that you can?t actually organize your party before to going into battle, like virtually every other turn-based RPG lets you do. The problem rears its head in the scattered ?ambush? battles that take place. In these battles you cannot swap in characters, so you?re stuck with whoever you had at the end of the last battle. This can be a real pain if your healer, for example, is absent from the party and you start taking a pounding. Christians have a tendency to give a sort of ?free pass? to Tolkien?s books because of its salient Christian themes, including the ideas of good and evil. Still, it should still be noted that the game, like the movies, is pretty violent. You won?t see the movie?s level blood in the game, but you can expect all the usual cleaving and stabbing that is the standard fare during the War of the Ring. The game, like the movies, is probably best-suited for a 13+ audience. While Tolkien was unwilling to allegorize his work (in contrast to C.S. Lewis), you can still see the imprint of Tolkien?s Christianity in the Lord of the Rings novels. Whether or not that imprint is clear in The Third Age is a matter of debate. What is pretty clear in the game, though, is the titanic struggle between good and evil that marked Tolkien?s magnum opus. The corruption of the ring isn?t as central to the plot of this game as it is the movies, but EA still manages to find clever ways to show the struggle within the heart of us all between good and evil. Perhaps unintentionally, the internal war between righteousness and sin is a major part of the plot during the latter half of this game. When I opened the GameCube version of the game, I was a bit surprised to discover that The Third Age came on two discs. (The PS2 and Xbox versions come on one.) This heightened my hopes that I had a really good, lengthy RPG on my hands. As it turned out, The Third Age was not the longest RPG ever created, nor the best, to be honest. But the end product is still pretty good in its quest to retell of the Lord of the Rings trilogy from another angle, and is still one of the better turn-based RPG\'s currently available on the GameCube and especialy the Xbox. I initially scoffed at some of the game?s linear, battle-heavy gameplay, but for some reason I found the combat addictively fun and well-paced anyway. Once you get a few hours into it, this game has the potential to really grow on you. There are stretches of the game, such as the battle with the Balrog and the pitched battles of Helm?s Deep, that are a sheer joy to experience. And while I think EA sacrificed a lot to give this game mass appeal, it still has enough going for it to warrant a good look. Give it a rental if you have doubts, but most fans will probably want to add this to their collection at some point.